We live in an interconnected world, where I, as one guy, can simultaneously exist in many places. But I can’t possibly be everywhere at once. So I rely on the amazing inter-connectivity of technology. In August, Facebook made a big mistake. They cut off Twitter from cross posting thanks to changes to their API that are meant to make Facebook more secure against groups like Cambridge Analytica. They made changes that broke Hootsuite. But what I think the decision makers there don’t realize is that Facebook essentially isolated themselves as a desolate island that you must travel to in order to visit its dwindling population. Neah, just come visit me on the mainland. With Facebook no longer receiving my posts, my wall has quickly become a wasteland. That means people aren’t responding to my posts on their platform, which means I don’t get any relevant notifications, which means I never open the app. As if I’m going to login to Facebook, having posted on every other platform with two clicks, to then copy and paste my same post to their platform. As if! I don’t use Messenger anymore (XMPP discontinuation: another bonehead move on Facebook’s part), have moved our chat to Discord (who have a wonderful API and webhooks, I might add), and haven’t checked my wall in two months … and growing. Facebook thinks they’re too big to fail. I remember when MySpace was huge. I think I still have a MySpace account somewhere. I think my Facebook account will inevitably fall into that same forgotten realm of useless services that I no longer use. My method is not for the person who wants to be able to spend time on their cellphone, chatting it up, nor the person who wants to have blazing Internet speeds on their phone while they’re hiking through Algonquin Park. This is for those of us with very basic requirements, who need a phone out of necessity… for emergencies… and don’t want to spend a bunch of monthly cash to do it. Let me tell you a little bit about me, and perhaps shed some light on why you may have received an answering machine or two when reaching out to me. I’m not one to spend much time on the phone. In fact, I do almost all my communication either in person or by email. I’m not a brain surgeon, nor the President of the United States, so I’ve never felt “important enough” to need to be accessible 24/7 no matter where I am. So I’ve never gotten myself into a costly phone contract, because it simply wasn’t a necessary expense. However, recently we had our new alarm installed at the studio thanks to Froggy.ca, and the alarm monitoring company needs to be able to get a hold of me in event of break-in or other emergency. Otherwise, they might send the Police to false alarms should they occur, resulting in a hefty fine from the local emergency service. So I started doing research, and realized a few things about my needs. I am almost always within reach of a WiFi connection, and when I’m not, I don’t want to be. For example, I don’t need to have Internet while I’m at the beach or eating dinner at a restaurant with my darling wife. I never use the phone. I need it for emergency use only, and perhaps the rare short call, but nothing to warrant the 500 minutes a month of a standard phone contract. I want a phone out of necessity, not desire for constant contact, and therefore I do not want to have to spend the $35+ per month on a phone contract. I use an iPod Touch 4 to keep on top of my inbox. I know it’s on its last legs (they’re not built to last), plus I don’t want to have a phone and iPod in my pocket–so a smartphone makes more sense to me than a flip phone. I want to remove the iPod from the mix entirely and just have a single device for both purposes. With some back-and-forth between the Category5 TV chat room, and discussing with a few friends, I came up with a brilliant solution, and I must say it’s working great! I now have a smartphone–a Samsung S730m Discovery Galaxy–with no contract, and I pay just $6.25 per month for it. First of all, I bought the phone. That’s right. I paid outright for a refurbished unlocked smartphone. I’ve never done this before, but the freedom is wonderful! I got to choose my phone from dozens of available options, and got a great deal (I paid $90 Canadian) since it’s a refurb, and not the most current of phones. Check out the amazing selection on Amazon! One of them is bound to work for you. By purchasing the phone outright, I am not tied to a contract. It’s how the phone companies get you: they promise a free smartphone, or one for very cheap, but you have to sign up for $35 per month for 2 years (Wind Mobile). So I’ve avoided the contract, and the high monthly fee (but had to pay nearly $100 up front for the device–a fair trade-off). The other advantage to buying the phone is that for less money in the long run, I actually end up with a better device. The ones being offered at the $35 / month contract level don’t hold a candle to the one I bought for just $90. You can get an unlocked phone for as little as $40 from what I saw, but again, I wanted to replace my iPod Touch at the same time. Secondly, we know I have easy access to WiFi. What about you? I think it’s pretty rare to be out of reach of a WiFi connection where you truly need it, at least for me. I have it at work, I have it at home, and my favorite coffee shops also give me free access. I do not need Internet while sitting on a park bench watching my kids play. I’d prefer to cheer them on and show some interest in what they’re doing. So scrub the need to have cellular Internet on my phone. I set the phone to disable using Internet on cellular networks, and I can still have high-speed Internet on my smartphone whenever I am within reach of a WiFi connection… which is practically always. Third, I shopped around. You’ll never guess where I found my service. After weighing about 15 different providers against one another, I walked into my local Petro Canada gas bar and picked up a SIM card and pay-as-you-go minutes. Whaaaaat? Why did I choose Petro Canada? For starters, it’s easy to activate my phone. I bought the SIM card for $10, which gave me the local phone number and activated my new phone. All I had to do was enter some numbers into a web site as per the instructions, and I was up and running. Not to mention, you get Petro Points for your phone service. That will mean free gas, free groceries, whatever I choose to redeem them for. I actually purchased a single $25 pay-as-you-go card. That’s it. Having read all the fine print, Petro Canada’s $25 card expires in 4 months. That’s 4 months of phone service, with no Internet (I’m getting that via WiFi) for just $25, assuming I don’t make an abundance of calls using up the card prematurely (which I won’t do unless there’s an emergency, in which case I won’t mind reloading early). $25 every 4 months is $6.25 per month. It doesn’t give me a lot of talk time. Roughly 50-100 minutes per month, but that’s actually more than I need. So for those who are like me and only need cellular service in an emergency or in a bind, I wanted to post how I did it and share with you that you too can get phone service in Canada for just $6.25 per month. Already have a cellphone? Cancel your phone plan and do what I did if you are paying more than you need to! Even $35 per month to have a “phone for emergencies” is too much now that we know it can be done for so much less. Please comment below and let me know what you think of my solution, and certainly if you opt for the same, I’d love to know about it. I guess I’m starting to feel old when I was actually part of the “good ol’ days”. How did this happen? Watching The Sing Off and realizing most of the great bands were born in the 90’s. Missing the days when conducting research was an experience, not a Google search. Hearing songs on the “retro” radio show that were brand new, hot tracks when I was a teenager. And looking at my baby girl who is fast becoming a little lady. Better make the best of each day, because this is all going way too fast. The problem with poor grammar: jokes don’t work. My embarrassing adventure at the LCBO. Ready for my embarrassing, yet utterly hilarious story from today? So, I decided it’d be nice to pick up some “Christmas Cheer” on our way home from shopping… sit by the fire tonight once the kids are in bed, with the twinkle of Christmas lights on the new-fallen snow… a perfect evening planned. It’s a lazy Saturday and I didn’t really “dress nice” or anything… just a track suit, and unshaven face. The snow also came on pretty suddenly (literally overnight), and I haven’t found my winter boots yet since our move in August. Keep all these details in mind. Scruffy looking dude, wearing a track suit with a junky jacket on top, and wearing running shoes in this blustery winter weather. I’m generally an outgoing person, and I like to make people smile just by being friendly and a little bit charming. I enter the LCBO up on Bayfield Street, and there’s a lady giving Whiskey samples up at the front. Turn on the charm, I say to her “Boy, am I glad to see you!”, a bit of a joke about her handing out samples of whiskey. Now, that would have been fine. As the words came out of my mouth, my shoes (yes, running shoes, on this wintery day) slipped as I entered the store. I stumbled, and slammed into the posts that you’re supposed to gracefully spin trough on your way in. Trying not to lose my cool, I proceeded to walk over to her table, still slipping a little. She looked at me … and it was clear she was judging me. OH MY GOSH, I realized; “She thinks I’m DRUNK”. GASP! She proceeded to pour me a sample, and no word of a lie: 1.5… maybe 2mL in the bottom of the glass! She didn’t want to give me a sample! She literally thought I was entering the store drunk! LOL! I can’t say I blame her! In walks scruffy guy. “Boy, am I ever glad to see you!”. Trip. Slam into pole. Stumble over. Drink 1.5 mL of Whiskey. MY GOODNESS, that was about as embarrassed as I’ve ever been (when I realized what she was thinking), and I have no doubt in my mind she has since told people about this “drunk guy” who visited her tonight. My word! Well, for the record, the whiskey was nice (all 1.5mL of it). I might have bought some if I didn’t feel it important to quickly get away from that table as fast as I could! Windows 8 looks like a messy wall decorated by a 6 year old. 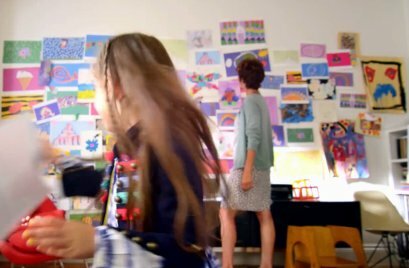 Screenshot from the new commercial depicting the Windows 8 home screen by way of metaphor. Yes, it looks like Microsoft hit the nail on the head with their first commercial for Windows 8. In it, they depict the Windows 8 interface metaphorically. It looks like a messy wall decorated by a 6 year old.